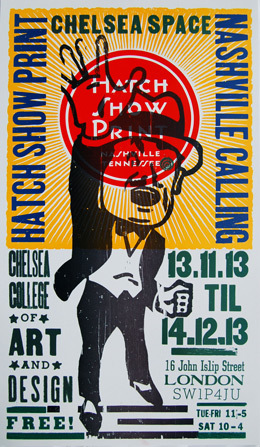 CHELSEA space presents the very first UK exhibition dedicated to the American letterpress art of Hatch Show Print based in Nashville, Tennessee. This exhibition will represent a rare opportunity to view archive material and stunning posters from one of the world's greatest producers of letterpress design and explores the importance of the art of the poster in the history of communication. Originally established in 1879, in a world before TV advertising and the internet, Hatch Show Print used strong design to convey information to the widest possible audience – a visual ‘shout’ across the American landscape. 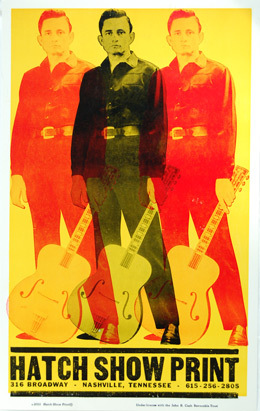 Hatch’s design success is most closely associated with posters for Country Music and Americana, but also Blues, Jazz, and Rock and Roll including work for musicians such as Bessie Smith, Duke Ellington, Louis Armstrong, Hank Williams, Johnny Cash, Elvis Presley, Dolly Parton, Merle Haggard, Aretha Franklin, and Neil Young to name but a few. Originally making posters for religious meetings and travelling entertainments Hatch also produced eye-catching designs for local businesses, product advertisements and political rallies. Using archive artefacts, ephemera, photographs, film, and the brilliant poster designs from the 1920s to the present day, this exhibition explores Hatch’s history and its unique position as information network, universally respected art and design agency, and cultural icon. Hatch Show Print is owned and operated by the Country Music Hall of Fame and Museum.